OAKLAND, Calif. — Expressing concerns shared by many California communities, affordable housing activists gathered on the City Hall steps, June 19, to protest long delays by the City Council and a blue-ribbon commission in preparing proposals to increase affordable housing and to protect tenants whose buildings are converted into condos. “We’re here to tell the City Council that they’ve been working on these issues for years, and while they’re going on summer recess, the need for affordable housing is not,” Pastor Lucy Kolin of Resurrection Lutheran Church told the World. Skyrocketing housing costs are forcing more and more Oakland residents, including members of her congregation, to leave the city, Kolin said. Among the urgent measures needed to help stem the tide, she said, are zoning requirements for developers to provide units for low-income residents and greater protections for tenants in condo conversions. A rally before the council meeting called by the Oakland People’s Community Housing Coalition, an alliance of community, labor and faith-based organizations, heard tenants, including seniors and people with disabilities, tell how their living conditions have worsened and their housing costs have risen despite current tenant protections. Speakers challenged the council to act promptly on the issues when it returns to work in September. City Councilmember Jane Brunner and a representative of Mayor Ronald Dellums pledged their support for measures to keep Oakland affordable and preserve the community’s diversity. 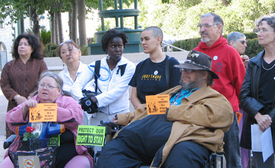 As the meeting opened, speakers including Amie Fishman, executive director of East Bay Housing Organizations, presented a Housing Bill of Rights calling for housing to be affordable and accessible to people at every income level, environmentally sound and racially integrated, and protected against unjust evictions or displacement. Among several speakers addressing the council was Oakland High School teacher Cassandra Lopez, who told of the destabilizing effect the housing crisis is having on the schools. “Every week students are forced to move out of Oakland because their families can’t afford to stay,” she said, adding that African American families are especially affected. “Affordable housing is vital to our students’ ability to get a good education,” Lopez said. The People’s Housing Coalition says the council has been discussing inclusionary zoning since 2000. The requirement was opposed by former Mayor Jerry Brown but is supported by current Mayor Dellums. As a result of maneuvers within the council as Brown’s term was ending late last year, the issue was shunted to a blue-ribbon commission which was later asked to also consider condo conversion regulations. Though the commission was to finish work in March, it has still not issued a report.